I have a life list. I wrote it years ago and there are things on it now that I scratch my head about, but it's still my life list. It's a long list of things I want to do in my life. Although it needs some revising, there is still plenty of things I want to accomplish that's on the list. Currently I am working on item number 142 on that list. It's an item that I was nervous about for some reason but clearly shouldn't have been. When I was little I read The Hobbit with my dad. I don't remember how long it took us but every night we would read a few pages or a chapter from the book. But something I never did was read the rest ofThe Lord of the Rings. I always viewed them as a huge mountain that I would never be able to get passed. I never wanted to read them during a Reading Challenge because I thought it would take too long. A few weeks ago I finished this year's Reading Challenge of 32 books and decided to take on this challenge. 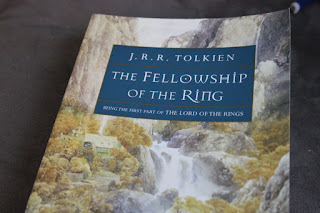 So I started reading and quickly found that the first book, The Fellowship of the Ring, wasn't nearly as challenging as I thought. In my mind this books were written by someone like Austen or Dickens with long confusing sentences. But in fact the book was written in the 1950's. In about a week I was already 80% of the way through the book and enjoying it. I found it a much quicker read than I ever expected. I still have a ways to go before I can officially cross this off my list but as it turns out, it's not as horrible as a reading experience as I expected. So here's to surprising, enjoyable read!